Inscribed "Lytham St Annes Art Collection" on back of frame. Anthony Vandyke Copley Fielding, commonly called Copley Fielding, was an English painter born in Sowerby, near Halifax and was famous for his watercolour landscapes (Rossetti, 1911). He was the best known and most prolific of a family of brothers who were all painters. He trained initially with his father, Nathan Theodore Fielding (fl.1775-1814), a portrait painter. He travelled with him to Liverpool in 1807 and then to Wales in 1808. In 1810 he entered the Royal Academy schools where he was taught by John Varley (1778-1842), an English watercolour painter and astrologer, and a close friend of William Blake (1757-1827) (Rossetti, 1911). Fielding was particularly proficient as a watercolourist - he exhibited regularly from 1810 at the Society for Painters in Watercolours (RWS), often sending 40 or 50 pictures a year. He became a full member and secretary in 1813 and president until his death in 1831. “No man has ever given, with the same flashing freedom, the race of a running tide under a stiff breeze, nor caught, with the same grace and precision, the curvature of the breaking wave, arrested or accelerated by the wind.” Unfortunately, ​many of his watercolours have faded because of the use of indigo (Wright, 1978). ​Fielding died in Worthing in March 1855 (Rossetti, 1911). 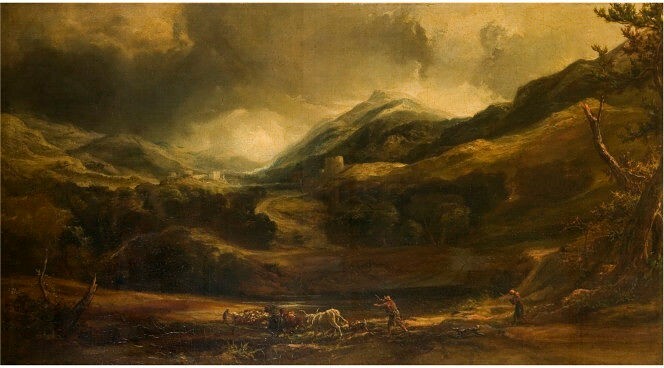 Examples of his work, painted 1829 to 1850, can be seen in the Victoria and Albert Museum, see below.